The official press release about the opening of the Oakville Centennial Centre. On Saturday, December 9th, 1967, at 2 p.m., Oakville’s million dollar Centennial Project will be officially opened by The Honourable William Earl Rowe, P.C., LL.D., D.Sc.Soc., the Lieutenant-Governor of the Province of Ontario. The Oakville project consists of a new Central Library and an Exhibition Gallery together with an all-year-round swimming pool. This complex is grouped on a site in downtown Oakville that for over 100 years has been known as "The Old Central School Common". This Centennial Project represents more than just a combination of needed civic buildings. The Project reflects what can happen when the people of Oakville, their Town Council, together with a group of Boards and Commissions blend their thoughts and ambitions into a common concept on one parcel of land with a singular architect and building contractor. Quite an achievement for a town which experienced in 1962 a political amalgamation of the former Township of Trafalgar and the old Town of Oakville into the new Town of Oakville with a population in 1967 of just under 55,000. 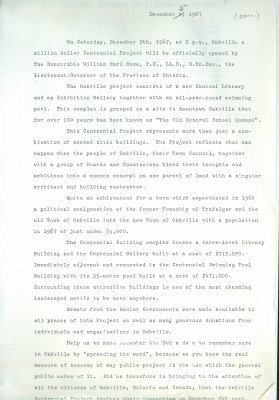 The Centennial Building complex houses a three-level Library Building and the Centennial Gallery built at a cost of $712,5QO.Immediately adjacent and connected is the Centennial Swimming Pool Building with its 25-metre pool built at a cost of $471,000. Surrounding these attractive buildings is one of the most charming landscaped motifs to be seen anywhere. Grants from the Senior Governments were made available to all phases of this Project as well as many generous donations from individuals and organizations in Oakville. Help us to make: December 9th a date to remember here in Oakville by "spreading the word! ", because as you know the real measure of success of any public project is the use which the general public makes of it. Aid us therefore in bringing to the attention of all the citizens of Oakville, Ontario and Canada, that the Oakville Centennial Project invites their inspection on December 9th next.